So it’s been snowing for a couple of weeks now. This was a photo I took after the first big snow in Krakow. It was 7:30am (I have an 8am Monday class – it kills me every week) so no one had cleared the paths yet. I never realised it could be difficult to walk in. I didn’t realise that some of the cobblestones in Krakow have a funny kind of glaze or something on them which makes them absolute death traps once a little bit of power’s on them. I seriously found it that difficult to walk without almost slipping all the time that at first, I had to leave five minutes earlier for class to avoid being late It sounds stupid but it’s true – I have almost fallen over so many times. So I took to walking very deliberately and very slowly. 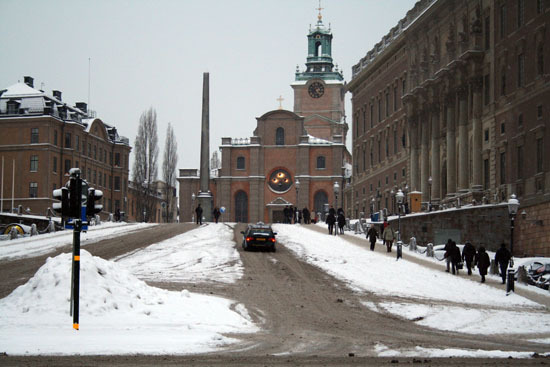 By the time I went on a holiday to Stockholm last week, I thought I had the hang of walking in the snow, but then I was confronted with some we don’t have in Krakow: hills! Or at least very slight inclines – Krakow is pretty much completely flat. I honestly thought I was going to lose my footing and end up sliding down this one. I feel like a complete idiot because everyone else seems to be able to walk along normally, and this seems like such a simple thing… but snow has given me so much trouble in terms of staying upright, and I completely didn’t realise that would happen! This entry was posted on December 12, 2010 by lucychapman. It was filed under I wish someone had told me, Poland, Sweden . 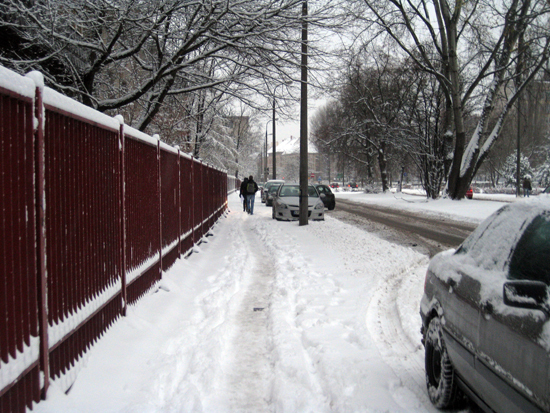 The “snow shuffle” – looks like a robotic, flat-footed, stilted or geeky walk. So, so, so different for Aussies who, unless you have spent back to back ski seasons in NSW or Vic, it is something quite foreign. A whole new skill set. Colorado was exactly the same .. but luckily where I was (on the Greeley plains) was a fairly flat landscape. But being an “un-co” in a snow drenched environment has another set of aesthetic rewards. Snow is a novelty – and I loved it. Probably hard to crystallize in words. A tacit knowledge perhaps that only those who have lived in a snow drenched environment will be able to relate?